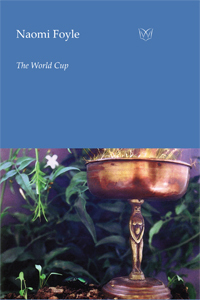 The World Cup is simultaneously the Holy Grail of a female football fan; an oceanic chalice of tears; and a brimming goblet of history, culture and myth. In a kinetic sequence of poems that journeys from Mexico and post 9/11 New York, through the conflicts in Ireland and the Middle East, to a no-holds barred game of love thrashed out in London, Brighton, Amsterdam and Greece, Naomi Foyle amply displays not only her abundant lyric and narrative gifts, but also a winning warmth and humour. Though its honest brew of self-reflection is at times almost painfully intimate, The World Cup comes laced with astringent socio-political comment, and is stamped with the trademark Foylean wit.